When I initially put the selection of Beach Boys records I own up to a vote(on vinyl, though the CD set is actually not much different), I debated listing this one as it physically presents itself. Those familiar with the album may notice (probably immediately) that the cover looks a bit strange. Truth is, this is actually a compiled double album, paired with Carl & the Passions – So Tough. It’s a weird looking thing, and one I own as yet another of the doubled (in the case of Pet Sounds, I think tripled or more, really) records my dad let me take. I’d call it the “crown jewel” of that set, but there are albums I like more personally (including my other Beach Boys record, Surf’s Up), but as something to blurt out at others it sounds more like it validates my taste and knowledge. That said, this is probably the one classic album I own on vinyl that I’m in a bad position to write on. The poll that is still running on the Beatles as of writing indicates my limited selection of their material on vinyl–certainly, it includes their oft-considered best by those who stop and measure (rather than responding by reflex), but it doesn’t include the iconic, name-drop title (Sgt. Pepper’s Lonely Hearts Club Band), so there’s a certain measure less pressure. More to the point, that alleged best is also my favourite, so, much along the lines of Pink Floyd, I’m a bit more at ease dealing with it (the equivalent there, if you’re wondering, is Wish You Were Here–less an icon, more a qualified work. Depending on who you ask, of course). Here, I’m in territory I regard similarly to Dark Side of the Moon or Sgt. Pepper’s Lonely Hearts Club Band: albums whose reputations precede them, and who have been so automatically doled out to responses to “What is the best album…” that the question doesn’t even need to be finished. For those bands? For rock music? Some people just list those because it’s “the answer”, some because they sincerely believe it and can explain it, and a handful reject it out of hand primarily because some people do the first. I don’t much like dealing with albums like these publicly: it puts me in the position of having to establish a clear opinion–which means detangling and cropping off the influence of reputation and the opinion bluffs of those who feel the need to automatically bring the public impression of their taste to the same level, and finally that of those who emphatically feel the need to reject it simply to prove the “honesty” of their opinions. I make a show of acting nervous or intimidated by writing about something written about a million times before, but I’m not writing this for money, so it isn’t as if I need to justify the cost to those who paid. More than anything, I don’t like the segment of that which means I have to tell you something that isn’t obvious. I have a lot of leeway with obscure or semi-obscure items, as the unfamiliar will have nothing to attach to it anyway, and the familiar will be looking for the familiar to find common ground (or to argue against it). In this case, I’m also left with the opinions of Sir Paul McCartney, of Sir George Martin, in attempting to address an album widely considered one of the most ground-breaking and influential of all time. A response to Rubber Soul and the inspiration for the album I just mentioned three times above: Sgt. Pepper’s Lonely Hearts Club Band. Thought in some ways to have been handed by the torch from Rubber Soul–itself given an infusion by the work of Bob Dylan–to carry the music industry out of the 45rpm single market and into the embrace of the 33 1/3 album approach. Those are some long shadows. But that’s the reason I poll when I can: it means I don’t get to just dodge this, it means I don’t get to run off and happily talk about Surf’s Up and never have to nail down and clarify any thoughts I had, have, or will have about Pet Sounds. Or, it means everyone’s tired of hearing about Pet Sounds and I shouldn’t–if I weren’t directed–try to challenge myself. I know some people aimed for Surf’s Up (it was relatively close!) 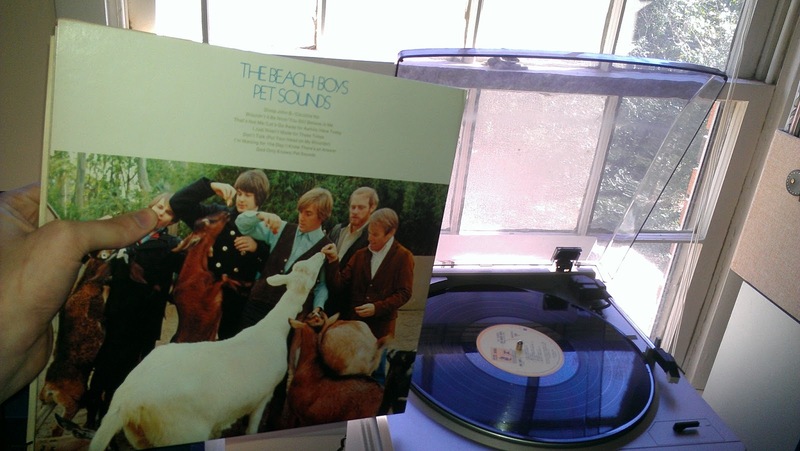 out of a personal affection, and some because it’s “not Pet Sounds“, in effect. So that’s where we ended up: more wanted to hear my thoughts–or torture me, perhaps–on Pet Sounds. I will do my best to live up, not to the reputation of the album or writing around it, but to be clear and as thoughtful as I can. I have notes (which I only occasionally take) as well as the information I have lingering around already–the Pet Sounds Sessions box set (with liner notes) and the 40th Anniversary stereo/mono dual release (in effect, I own about 6-7 versions of the album, counting the instrumental and vocal-only tracks on the box). Not so that I can just regurgitate Brian’s commentary or that of paid writers who got there first, but so that I can be most accurate regarding instrumentation and techniques involved in creating sounds, moods, tones, and atmospheres that I identify. Beginning an album with a song that would become a single (though it started as a B-side to “God Only Knows”) was not an uncommon thing in the 1960s, but the totality of “Wouldn’t It Be Nice”, particularly its intro, is still a sort of odd move. The sound of that opening (which apparently no one can confirm the instrumental identity of) that sounds rather like a harp is distinct and recognizable, but suggests nothing of the sounds one expects from the Beach Boys, the song that follows it, or the genre as a whole. Hal Blaine’s lone drum hit shifts the song entirely, and lets the intro fade quickly away, with Brian immediately launching into the chorus with his voice at full power, and the whole band (of session musicians–many with tens of thousands of credits under their belts at this point, and I mean individually) backs him for the rest, with Al, Dennis, Carl, and Mike assisting primarily with Mike taking over for the bridge. It’s a full, powerful song, using accordions, saxophones, mandolins, piano, organ and a variety of more expected instruments to chug along with a kind of energy that does not represent a large chunk of the album. It slows partway through, for just a brief time, which is quite unusual for an earlier pop album, at least in so distinct and constructed a way. The energy that keeps “Wouldn’t It Be Nice” moving at such a quick clip (a lot if it driven by the accordions) is left behind almost entirely for “You Still Believe in Me”, though the intro is somewhat reminiscent of that song’s own introduction–even down to the bizarre methodology used to achieve the singular instrumental backing for a humming vocalization that seems to reverberate just slightly, but ethereally: album co-writer Tony Asher says one of them was left to crawl into a piano to pluck the strings, while another sat at it to let the notes ring. As the song proper starts, we’re at a much slower pace than “Wouldn’t It Be Nice”, and Brian’s vocal is given a great deal more space: the song is more intimate, more personal. The backing is no less complex, with timpani and harpsichord accompanying the far more expected bass guitar. Backing vocals primarily define the repetition of the song’s title alone, which is useful as it allows for Brian’s “I wanna cry” to take its looping shape as an isolated voice. There are strange touches that hint at its place in psychedelia in this track, too: bike horns and bells seem to drop in from nowhere in particular–not incongruous, yet startlingly odd at the same time. Brian abstains from lead vocal only a few times on the album, but the first is on “That’s Not Me”, where his cousin Mike Love takes over, the tempo fittingly speeding up (as Mike Love is generally more aligned with the lighter surf songs of the group, which are generally uptempo in line with their “fun” nature). Brian Wilson’s opening on the organ eventually becomes notes that are just held for long periods of time, creating a hum in the background. Tambourines set the half-shuffling beat, strangely filling the middle ground of the song, which is primarily percussive and low end behind Mike’s voice. The song is one of the more drug-like and odd, despite being, in some respects, more conventional. The absent middle space, in particular, gives it a slightly weird feeling. It’s almost like we have “You Still Believe in Me” Part 2 when “Don’t Talk (Put Your Head on My Shoulder)” comes following in, as Brian returns to lead vocals. The song is slower, sadder, and has the first appearance of strong strings. It’s sweetly sad, though: obviously Brian is addressing someone in pain, but is offering consolation and hope. He asks the listener to listen to his heart beat–and for just a moment, the bass emulates a heartbeat. The bass thrums underneath it all even outside that moment, but the song has a comfortable embrace: it’s spacious, but not cold and filled with empty parts. Giving the impression of alternating tones, “I’m Waiting for the Day” brings the tempo back up, with the curious choice of a percussive intro, though the use of timpanis gives a bit of variation in pitch, snare hits tweaking the sound just enough to kickstart the song, as if they are the turns of a key to start an engine. And when that engine starts, it’s with an organ’s keys slid across and then hit lightly but rapidly, the melody actually briefly introduced by flutes, but then taken over by violins as Brian begins to sing the verses–acknowledging the hurt of someone abandoned that he is attempting to bring solace to. “I’m waiting for the day that you can love again”, he sings, and the song jumps upward, as does his voice, which takes on a slightly harder edge, though an edge denoting determination rather than threat. The backing vocals–all Brian–move around each other for another of the drums’ moments of not only emphasis, but actual appearance: most of the track is absent the drum kit, though the timpanis do have a relatively strong presence through much of it. A last hushed lead up to “..when you can love again”, gives us a pretty string outro, but the drums don’t seem to want this to happen, and bring the organ, the backing Brians and timpanis back for him to repeat, “You didn’t think/That I could sit around and let you go”, which has that determined, self-confident edge as it fades out. There are two instrumental tracks on the record, and the first is “Let’s Go Away for Awhile”, which would be the end of side one, were it not for the decision to include a studio-unrelated recording (“Sloop John B”). Julius Wechter mans the vibraphones and defines the majority of the track as a result, which builds on a sound only they can provide: both percussive and gentle, melodic and curved but distinct. There are numerous instruments layered behind them, especially a piano that gradually takes over and brings horns with it, a drum fill bringing the song back down to a hush, but one that cannot keep down the string section, which builds the song back to horns, which only build more, to a seemingly unified note, then isolate themselves. A brief appearance from what I believe are temple blocks–echoing in the background behind the vibraphone, the overdubbed strings only gently drawn in the background, but a faux-steel guitar (apparently a Coke bottle on the strings) gives a bit of a rounding to the edges of the song, with more familiar guitars given their place, too. The intermittent drumming that crops up on the album appears again, marking separations in the piece to great effect–the absence of the drums previously is emphasized, yet so is the actual appearance. It’s really a great piece–no surprise Brian is most proud of this one. 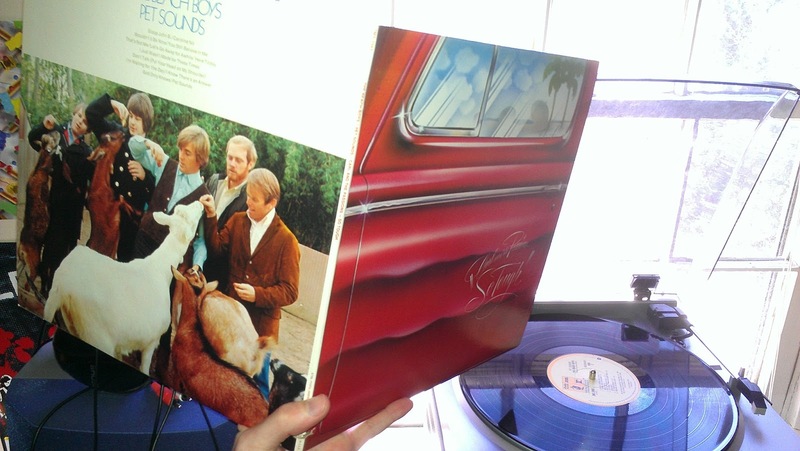 The only cover on the album, “Sloop John B” was recorded long before the primary Pet Sounds Sessions, but doesn’t feel as out of place as rumours that it was jammed in suggest (evidence suggests this was actually not the case). The song was a traditional folk one, an arena with which Al Jardine (the only non-family in the original Beach Boys) was most familiar. A metronomic tapping and glockenspiel descends into Brian’s vocal, and slowly other instruments join up, a guitar, a bass, drums briefly, and then more steadily, another voice (Mike Love’s) comes in for the bridge and the chorus, after which, the backing vocals appear briefly in non-verbal form, and by the next chorus, the drums are regular and consistent, all the voices are joined in, enough that the instrumentation disappears entirely for a brief a cappella moment. The drums finally make up for lost time and pound every beat as the song fades, along with Side One. A huge single for the group, “God Only Knows” opens the second side with French horns and keys, with a bass line linking it to the first verse, where we get to hear Brian’s brother Carl sing lead for the first time on the album. A simpler, wood block/temple block rhythm backs the verses, though a deeper rhythm transitions it to the next verse. When Carl gets to the title of the song, there’s a curious moment as the rhythm is broken and chopped from the steady beat it used previously, quite staccato but for a brief fill on the drums. Backing vocals that flit around each other converge and pitch upward to Carl’s repetition of the title that leads to the second verse. Later the voices of Brian and Mike are recognizable in alternating vocalizations of the title that start a beat off from each other and begin to spiral together, emphasizing the sentiment of the song in general: it’s a bit sad, but with a warmth and brightness at the core–who knows what the singer would be without the addressee, but they are both there right now. At one point, we might have had “Hang on to Your Ego” next, but the title was changed and we’re instead left with “I Know There’s an Answer”. It’s centered around an intro of mutliple key instruments that lean into their parts, but a buzzing of baritone and tenor saxophones hovers in the background, with the rhythm defined by a tambourine. Any attempt to listen closely only reveals that it’s nearly impossible to pick through all the layers. The choice of baritone saxophone for the solo, backed by banjo is beyond peculiar, and slants the song in a way that a number of songs on the album turn: somewhere that is, on the surface, comforting pop, but something else alongside it. “It starts with just a little glance now/Right away you’re thinking about romance now” begins “Here Today”, keys pounding rhythm and slowly transitioning melody under Mike Love’s voice, drums and tambourine pounding down each beat as the song moves in, his voice rising slightly and getting somewhat faster paced, until it all falls back down, and the pounding heart of new love is brought back to reality with the reminder: “You’ve got to keep in mind/Love is here today/And it’s gone tomorrow”. I will forever associate the next song with my best friend in high school and college, who was getting into 1960s music when we lived together, and spent a while with the Beach Boys before I ever did–I could name at least a handful of peculiar injokes we ended up with, but few would make sense to anyone else. Still, “I Just Wasn’t Made for These Times” is a track that I think of him referencing the phrase a few times, and so the part that sticks strongest remains the title’s appearance in the lyrics. It’s odd, as it seemed that my friend meant the phrase in the reverse–being born too late, not early–and that moment is out of character, tonally, for the rest of the song. The song is light and airy at first, but there’s an odd temple block construction, and a backing of “Oohs” that seems almost as if it’s mocking or out of step (or rather, pitch) with Brian’s vocal. They even get to share the spotlight without any backing for a moment–it’s hard to tell what feels (quite deliberately) mismatched there: are the backing vocals sadder? Are they just significantly lower? Not harmonized? And then you hear a higher, modulating voice–but it’s not, and that rapidly becomes apparent: it’s the infamous theremin that Brian later made such famous usage of in “Good Vibrations”. As a title track, “Pet Sounds” is weird. As a track on this album, despite the matching titles, “Pet Sounds” is weird. Ratcheting percussion launches it, hints of guitar that are distorted as if some force has knocked them silly appear, before a lightly wavering guitar line takes control of the piece, horns subtly building it up, but all of them stopped short for a moment. When it returns, the horns push again, seeming to attempt to take control away from the rather “castaway” guitar sound, bongos and tons of other instruments wandering in and out, until one baritone saxophone bleats out the noise that introduces the first large crescendo that comes to define the latter half of the piece. “Caroline, No” is not necessarily the expected favourite, but it is indeed Brian’s favourite track from the album. A very dry tambourine defines the beat of the song, but is fleshed out with an organ line and Brian’s double-tracked vocals. A lone drum beat echoes at the start of each measure, as Brian pines for a girl who broke his heart. Woodwinds (primarily bass flutes) repeat the melody after Brian’s last vocalization of it, with light accents from the vibraphone we thought we’d heard the last of, until it all fades away. And then it fades back in, but not with the music we know: it’s the ringing bell and whistle of an oncoming train, dogs barking and finally that train passing, rattling the tracks and heading off into the distance amid the last barks of those dogs. I find it no less difficult now to talk about this album: I found nooks and crannies I’d not heard, I gathered a lot of the elements that bring it lasting respect that I had taken for granted previously, but I’m still left with a central dilemma: how do you recognize brilliance after it is already labelled as such? Can you? Is there some element of self-fulfillment or expectation nascent in any attempt to explore or discuss a work so well-regarded? Can you really give it proper context once its context as brilliant has been determined, affirmed and re-affirmed? I don’t have answers to any of that. I’ve always enjoyed this album, so it’s not exactly the kind of stretch for me that it is to listen to some albums where I have to take time and understand why anyone likes them in the first place. There’s a production sensibility Brian brought to this that I always found unusual, which is the sort of gauzy haze layered over a lot of it. Maybe it’s the way the vocals are mixed, maybe it’s the way they’re recorded–it’s definitely something around the vocals in general. I listened harder this time and was still left wondering. I found new respect–a lot of it–for the instrumental pieces (which might easily be my favourite parts of this album), as well as reaffirmation of my love for Carl Wilson’s voice over the rest. I found new appreciation for the absurdly brilliant craft and layering of the album. That point, that was brought home. The way that each and every part seems to live and last only for the moments it is to be heard, for where it brings the whole of a song to a conclusion, or a feeling–that is something that almost defines the differing listening styles I know best. My aforementioned best friend, John (inevitably, at least a few people make repeated appearances if I talk about music) has always heard music “separated”, while I’ve always heard it as a whole cloth. If you do either, it’s difficult not to respect this work. Taken as a whole, an astonishing variety of sounds–recognizably different even without detailed listening–never seem to cause any conflict or confusion about the sound or feeling of any song, other than the kind that is inherent to the subject matter present. If you take the same piece and start to dissect it, you suddenly realize just how complicated that generally delightful sound actually is. Some parts fade shortly after others come in, without ever openly advertising that fact. Some are mixed low or off to the side and serve only to lock into their places and smooth out the whole of it all. There’s no doubt whatsoever that, in terms of the way this record is put together, its reputation is undoubtedly deserved. It’s full and lush and varied, yet measured and economic, and all the parts both fit and mesh without exception. Pet Sounds manages, in some way, to simultaneously run into the realms of psychedlia, art rock, even classical music, and simple pop: lyrically, it’s very innocent and sweet, occasionally even naïve, but never uncomfortably so, as it’s supported by the music so artfully. It’s catchy and bright and nice, and sad in the right parts, but it’s also dense and complicated and experimental and unique. It doesn’t show off the latter at all though: experimentation and complication are used in service of the final pop product. That’s not a common thing: usually you end up with something more like I Robot or Tarot Suite where those other elements make themselves known, perhaps even boast of their presence. It’s not necessarily a good or a bad thing in those instances–at least not intrinsically–but it’s something amazing to witness those things folded in so neatly there are no seams left. If you don’t respect this album–and I do say “respect”, as opposed to “like”–you would be well advised, if you intend on expressing a stance on it, or music in many senses, to explore and dissect it anyway, to try to see what makes it tick. While occasionally that metaphor is used to emphasize the idea that you might dissect a living animal and be left with none of the soul or life that drives you to find the driving force in the first place, this is more like a watch or a clock: find the parts and separate them out to understand it, but put them back together, wind it up and watch it go–it won’t miss a beat. Next Up: The Beatles – ?